SI local groups are encouraged to arrange workshops on a date and in a venue to suit their members. All the workshop topics require some understanding of indexing techniques, but most are suitable for students unless otherwise stated. Tutors’ contact details can be found via the directory or by contacting the office. The usual format is a 3-hour workshop running from 1.30 to 4.30 or 2 to 5, with a break for refreshments; most local groups arrange to meet for lunch first. Longer or shorter workshops can also be arranged on request. Workshop numbers are limited to 10 participants and members of the organising local group have priority. If numbers are low, the workshops may be opened to any SI member. 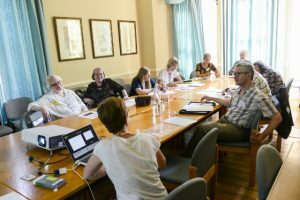 Once a local group has a minimum of 5 people interested in a particular workshop, the group leader is asked to contact the relevant tutor, to arrange dates and venues. Once a date/venue has been arranged the group leader should email the SI office. The office will book the venue (usually one sourced by the local group, though the SI office will do this if required) and email a booking form to the group leader for circulation. The Society funds the cost of the venue and the cost to each member will be the same as for any SI workshop, but time and money are saved by not having to travel far. If public liability insurance is required for the room booked, this is covered by the Society’s policy. The CPD Committee welcomes suggestions from local groups for workshop topics.